Kawasaki has hit the nail on the head with this bike. At the time of release, the market saw for the first time a practical, economical entry-level bike which is easy to ride and is desirable. Back then, the firm said 40% of buyers would be under 24 years old, going on sales of the 250, and we thought this bike was this kind of grassroots support motorcycling needs. 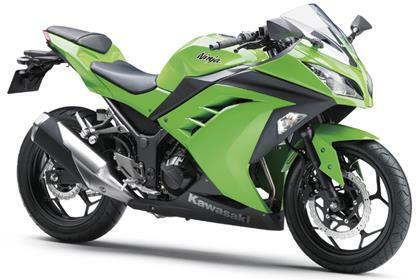 Kawasaki also said 22% of 250 buyers were female and while the seat is no lower on the 300, it is much narrower near the tank, which means it is easier to reach the floor for shorter or less confident riders. On the right road the 300 is fun to ride, and on some decent rubber it would be a laugh on track. There’s a slipper clutch for sideways fun for experienced riders and it will even wheelie if you’re brutal enough. The brakes have plenty of feel and ABS is an optional extra. It’s not obtained legendary status like the old KR1S, but still fun in the right situation. The shock’s preload is 5-way adjustable, however revised damping when compared to the Ninja 250 means the non-adjustable forks respond well. The parallel twin four-stroke engine might not have the thrill of a two-stroke, but it will happily cruise at 80mph into a headwind uphill. It’s not vibrating to death at motorway speeds like the Ninja 250 either. On the motorway 74mpg cruising was a breeze, and even at an indicated 93mph the rev counter hovered around 10,000rpm, 3,000rpm short of the redline, and not sounding too painful. Kawasaki has tried to reduce the vibration felt by the rider by rubber mounting the engine, and it’s worked. Fuel economy should be around 75mpg, meaning the Ninja’s 17-litre tank should be good for a 280-mile range. There are no reported faults with the Ninja 300 and the finish seems generally sound. The Ninja comes with a digital speedo, analogue rev counter, clock, fuel gauge and a slipper clutch as standard. ABS is an optional extra. 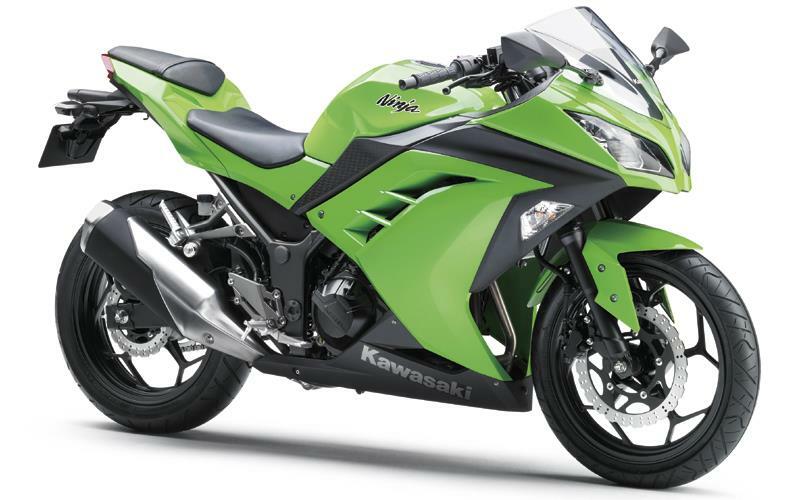 5 owners have reviewed their KAWASAKI NINJA 300 (2012-on) and rated it in a number of areas. Read what they have to say and what they like and dislike about the bike below. Bought 2nd hand with 3400 miles on. I have done around 2k of mainly daly commuting. Pretty much all seems great. Bought for a few reasons one being mpg which I can get around 73-74mpg but don’t get near the quoted 280 miles per tank. Around 205 the light is blinking away at me. Thoroughly enjoy the bike though and performs as well as you would expect a 300 to. Quite a narrow bike (part of the reason I bought it, so it can get up my side alley and in the back garden). Happy with the bike overall. Rev happy if you need it to be but easily manageable. It will react quickly if you open the throttle like an idiot. Very easy to manoeuvre in town between traffic. I do mostly B roads followed by centre town traffic and the bike glides trough it all. Would not recommend this bike only if you are doing any frequent motorway miles. She can do it but it feels like she is giving it all she has, all the time. I felt this at 80mph... As a whole, this bike works best as a in town commuter and B-road fun. It feels solid and powerful enough for a 300. I also ride a Suzuki GS500F 2004 and other than comfort and overall stability due to weight, the Ninja would still be my choice. Bought the bike new so i knew the brakes needed time to settle in. Still don’t feel they are the best compared to my partners Yamaha R3. I touch them and the bike responds a lot sharper. Maybe I’m not used to using both brakes as often as other bikes. Built well, no complaints. Still no corrosion even though I ride in all weathers. I only have a complaint which is, on both sides now, the decals are coming off. Replacing them will cost £25 per decal plus labor. Not something you want to do yourself. I’ve owned the bike from new with just 5500 miles by now. Every other part of the bike looks good. I’ve only had to take the bike back once because an issue was detected during the service. My rear wheel ball bearings got sorted within a week and under warranty. This did not affect the handling of the bike when i rode it for the time i was waiting to get it sorted. Only done the usual services in order to keep the bike with good service history at the dealership. Roughly £120 each but i know the next big service will be around £450. They offer monthly plans but I don’t want an additional direct debit on my account. Usually fill up my tank with £15/16. I’ve done 200 miles with a full tank being more conservative than not. Open the throttle and that will drop to 188 miles. Still good for me. Plus lots of fun on B roads. First time I bought a bike from dealer so don’t have anything to compare it to. It was an ok experience for me. The person that handled my purchase was very professional and a nice guy. My only gripe is after being told that my bike was one of the few left, I’ve now seen quite a few more waiting to be sold. I paid £5499. Decent engine, Kawasaki cheaped out big time on something's though. The OEM chain has to be replaced in the same amount of time the one I replaced with took to need it's first adjustment, which isn't so bad chains I expect to replace but come on Kawasaki that's pretty poor. The biggest issue I have with this bike is that I had to replace to fork springs. At about a year and a half off the showroom floor the front got very soft. I contacted Kawasaki and the rep said to replace the fork fluid, I told him that seemed like it was not likely to the problem based on the performance but eventually against my better judgement has the fluid replaced. It did not improve anything, and Kawasaki had told me that it's considered normal maintenance that they don't publish any thing about. Yes I do know that it is a normal maintenance thing, but on other bikes I've owned it's been anywhere from 7-8 years or the bike needed other things replaced and was getting to be such high milage (150k+) that doing the forks and then everything else wasn't really worth it so I just went ahead and got a new bike. The suspension on the ninja got to be so bad that it was a safety concern for me, I had rear wheel locks when I never would have expected it on any of the other bikes I've owned it the ninja during the first year, it felt unstable during anything but the most conservative commuter cornering, the front end would dip badly when letting off the throttle, etc. I tried to contact Kawasaki about it again and one of their reps just quit responding while I was emailing back and forth. So finally I just went ahead and replaced the springs. And all the sudden the performance was like it was during the first year of the bikes life. I contacted the BBB seeking reimbursement from Kawasaki figuring that they would at least do something, but no. No reimbursement for the first reps poor advice to charge fluid, and nothing for the replaced springs. Long story short I've been recommending against Kawasaki when friends ask about getting into a motorcycle, and I'll be going back to either Suzuki or Honda when I get my next bike. I know that the dealer's will say it's an entry level bike so it's not as well manufactured as some of their others, but my Suzuki was an entry level 250cc and never had any problems that got me to contact the manufacturer over owning it for 8 out so years. I just purchased this bike yesterday. Put 75 miles on it. Love this bike. I rode a GS500F, then went to a Shadow 750, and now here. I do a lot of street riding versus open road with big curves and this bike has been great for it so far. It's a lot more nimble than the Shadow and just as quick as the GS500. Seat position is a little more straight up versus your typical sport bike which is nice when I cruised on the highway for a little bit. I was able to get up to 95mph and still had some to go before redline (I'm 5'11'' and ~210lbs). Would definitely recommend to anyone looking for a practical yet fun motorcycle. Everything is great. I think the brakes are a little squishy but that's probably a me thing. Quality seems great. Not much vibration even at 95mph. It's too new for me to comment on reliability but Kaw doesn't usually put out bad bikes. Same as any other except the 7500 change. That one's a little pricier due to valves. Everything was cool. My complaint is the under seat storage seems kind of small compared to other sport bikes I've seen. Maybe that's a me thing too. Dealer - Was awesome. I bought from them previously so they took off $700.